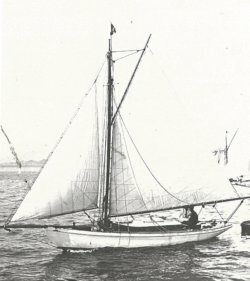 This is a growing database of classic vessels (pre 1940) with a significant connection to the region. Information comes from primary sources (mostly the Evening Post and NZ Yachtsman), and secondary sources (the more reliable being the writings of Harold Kidd, Robin Elliott and David Pardon). Where sources conflict, primary sources are generally given precedence. Bruce Askew's first notes on the database can be viewed here. Notes:Arrived Wellington 1911/12. To Lyttleton ca 1960s. To Auckland/Northland ca. 1970s. Subsequently to the Marlborough Sounds. Metric dimensions as described in 2010: LOA 14.6m, waterline, 8.5m, Beam 2.7m . 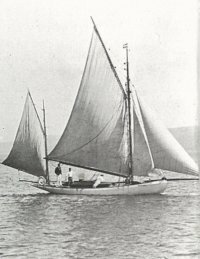 Scott and Jordan changed gaff rig to bermudan cutter in 1921, it was unsuccessful, and returned to a gaff cutter the following season. 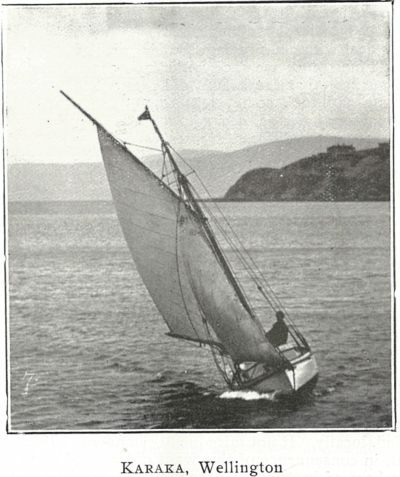 This bermuda rig is incorrectly said to be the first in the country (Zephyr in Lyttelton had one in 1886). 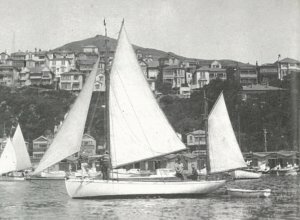 Converted to gaff yawl post 1930s. J Barker added an auxilliary in 1936. 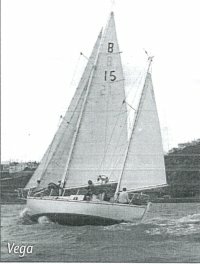 Converted to gaff-rigged ketch rig ca/ 1970s. 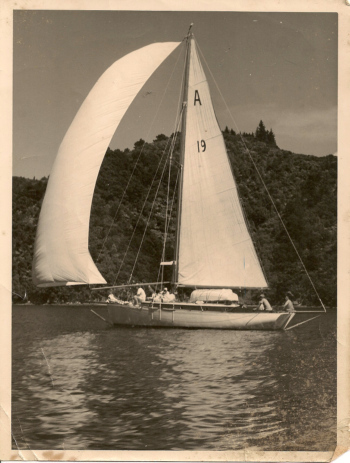 She was the flagship of the 1940 Centennial Regatta in Wellington. Notes:Seager converted to a launch with steam engine. Reverted to centreboarder, then converted to keeler with external lead 1910. Notes:9 tonner. 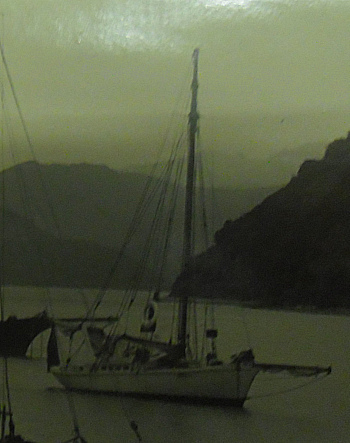 Moved to the Marlborough Sounds late 1880s as a goods transport vessel. 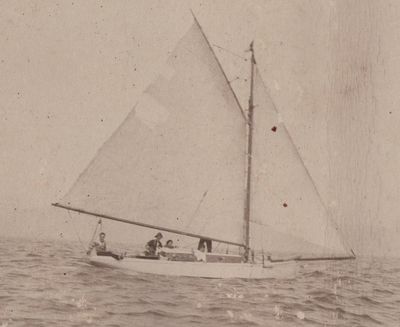 Notes:Built as centreboarder with a tuck stern, a counter added and converted to external lead ballast late 1910. Brooke-Taylor sold the boat when his sons enlisted in the army. Raced with the Evans Bay fleet with Durrant. Foundered and abandoned South of Tory Channel January 1932 no loss of life. Notes:Probably designed by Archie Scott. Later moved to Auckland and renamed Arcadia. Notes:Notes: 5’6” draught. Built along lines of Bailey trading cutters used for Tongan Group. 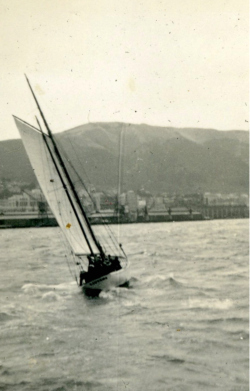 Entered Wellington to Lyttelton race in 1940 but retired with a torn mainsail. Broke moorings in Evans Bay on 21 Jan 1944 and came ashore at Shark Bay. An attempt was made to tow her off, but she was a total loss. Notes:Arrived Wellington 1937. 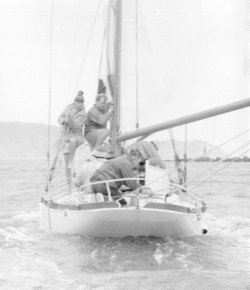 Lost with all hands during the 1951 Wellington-Lyttelton race. Notes:Arrived Wellington 1937. Lost in Cook Straight near Palliser after her crew were taken aboard a passing ship and Astral taken in tow by the ship when she succumbed. Notes:Donated to WCYT by Julian Matson 2013. 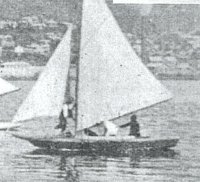 Centreboard configuration changed to external lead ballast 1914. Auxilliary (Overlander 4 cyl.) added 1927. 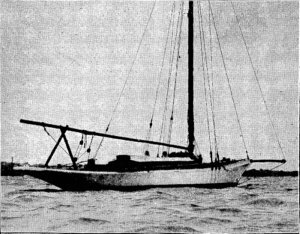 Converted to Bermuda rig 1938. Lead external ballast lowered and rig increased 1945. Fred Hendry was VC of RPNYC. Often referred to as "Atlanta". Notes:Imported from England to Wellington 1884. Good light weather sailer (second in B class anniversary regatta), but overall unsuccessful and unsuited to local conditions. Sold to a Sydney owner shortly thereafter. Notes:Built as a 3rd class yacht. Notes:In 1895 RPNYC club census. 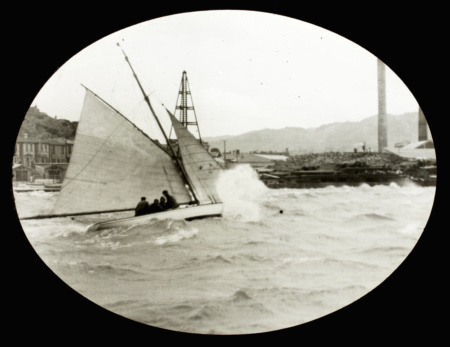 Notes:Sanks after being swamped off Oriental Bay or Jerningham in 1885, resulting in the death of Alfred Urwin. Those on board were a syndicate of employees of the NZ Times: Urwin, Joseph Kilfoy, Robert Prince and Harry Mason. The wreck was salvaged several days later. Urwin's body was never found. Notes:Had a 12' bowsprit. 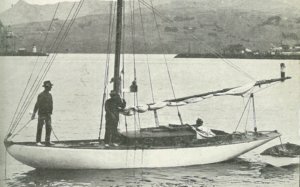 Stolen and sailed to Lyttelton 1888. 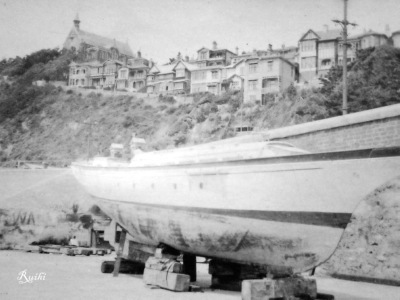 Notes:Was named Dorothy in Auckland, prior to Moore's purchase, who converted her to a launch. 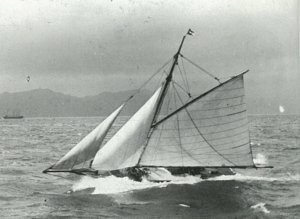 Notes:Possibly built in the South Island - known as a large and successful racer in Southern waters. Converted from cutter to steam launch for mail delivery work 1885, and renamed Gannet. Notes:In Wellington by 1886. 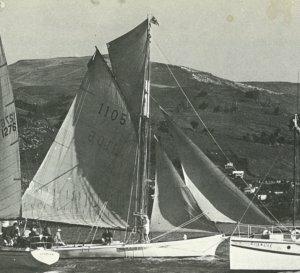 Represented Wellington that year in Lyttelton Regatta. 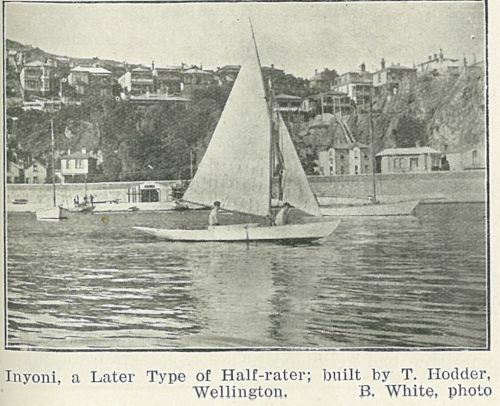 Rebuilt by Huffam in Wellington, and renamed Ariel in or before 1893. 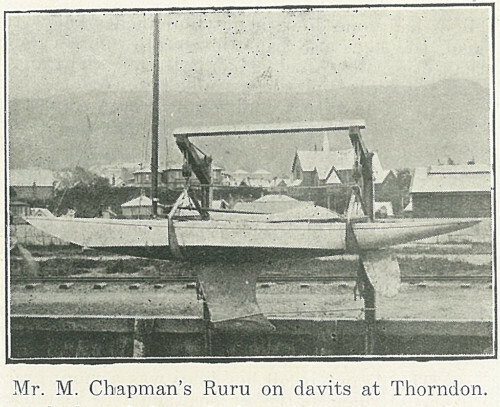 Notes:Raced with the te Ruru and Port Nicholson Motor-boat Clubs until the formation of the Evans bay Yacht and Motor Boat club in 1920. 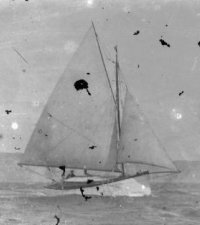 Notes:Whaleboat imported 1882. 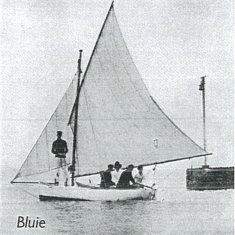 Clinker built, LOA 28'; Beam 6,6, yawl-rigged with two centreboards. Renamed Carina ca. 1888. 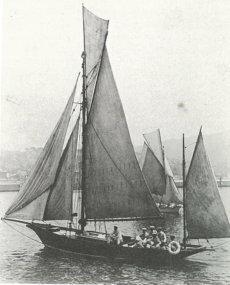 Significantly rebuilt to Coutts' design by Paul and Roberts at Clyde Quay in 1889 when the keel and forefoot were changed, external ballast and converted to cutter rig; and 1894/5 after running aground hull planking replaced. 1898 topside timbers replaced and was lengthened, new rig, fiddle bow and counter added. Dimensions above are the 1895 version. Broken up 1901. Finished life kauri planked carvel, LOA 40', beam 7,6. 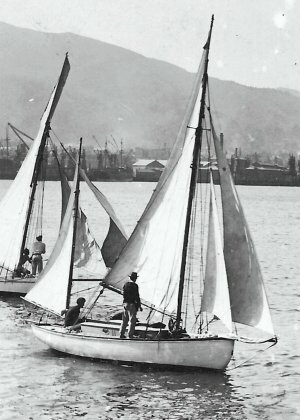 Coutts was one of the founders of the Port Nicholson Yacht Club. 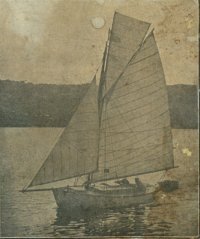 Notes:Converted to a yawl 1909/1910 by T. & K. Cole. 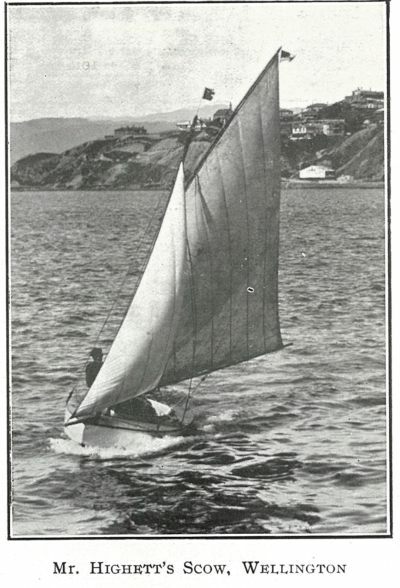 Bird was secretary of the Heretaunga Boating Club. Sold in 1916 for lead in keel for war effort. Wrecked at Cape Palliser. Hill, an Australian resident in Wellington, was noted for his solitary nature. He was sailing single-handed and survived the wreck. He rode a coach to Featherston, and walked from there to Wellington. 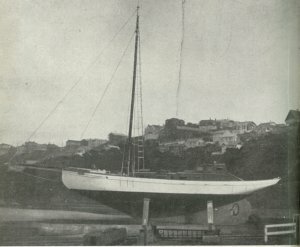 Notes:16 feet added to LOA, 1 ton lead added, and stern rail raised in 1886, After which she became scratch boat with Port Nicholson Yacht CLub. Renamed Mima. 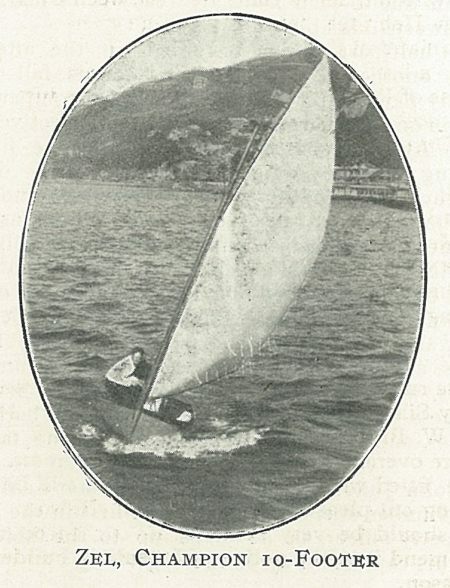 Kebble fell overboard while racing and drowned. Broken up 1904. 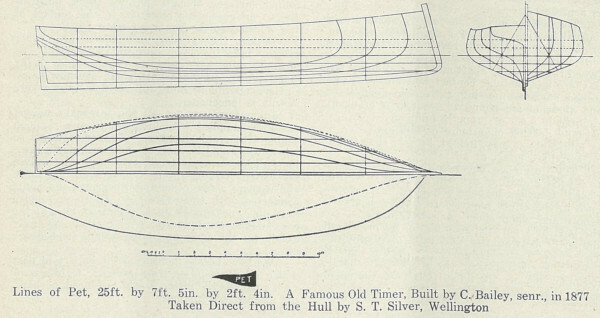 Keel lengthened in 1916/17, decreasing the rake of the rudder post. Generally felt to be better than Marangi after this was done. 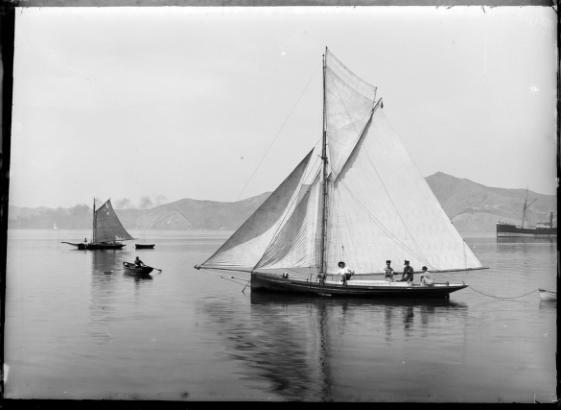 Notes:Active Wellington ca.1880s. Supposedly inspired by Pet. 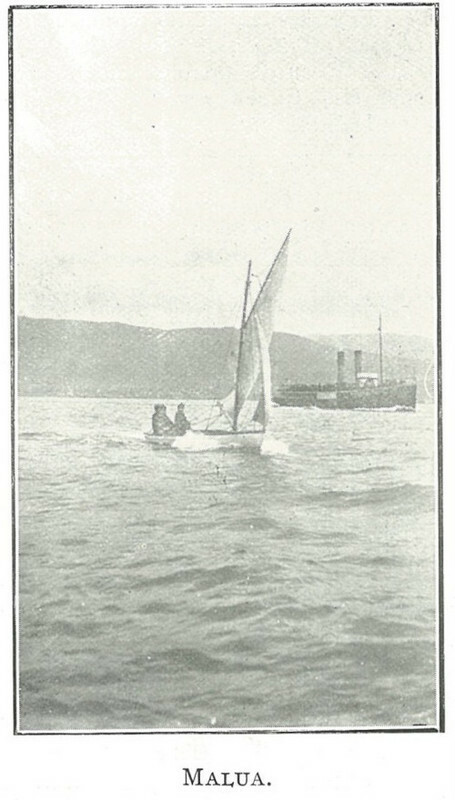 Notes:Arrived Wellington Jan 1879 en route to Lyttelton regatta. Sold as Good Templar 1881 in Wellington. Renamed Sappho by 1882. Renamed Alabama 1889. 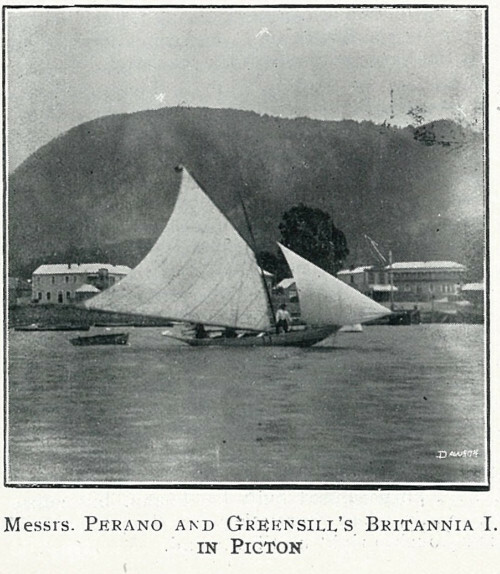 Renamed Weka 1891-1892. Later renamed Templar, then Patronus. 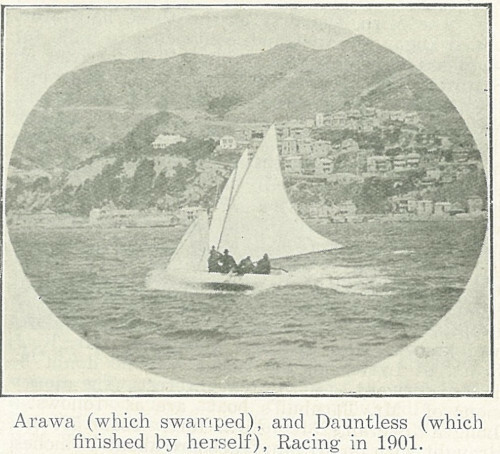 Went ashore at Kaiwharawhara 1888. Repairs by Taylor included replacing iron with timber planking. Broken up ca 1915 at Evans Bay. Notes:In 1895 RPNYC club census. Disappears from racing records after 1902. Notes:5,6 draught. 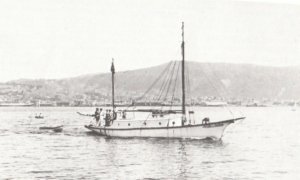 Norwegian Pilot cutter type. 16HP Lister diesel auxilliary. 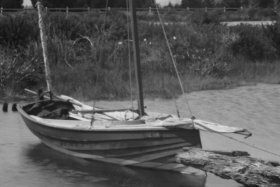 Notes:Griffiths was a founder member of the Heretaunga Boating Club. 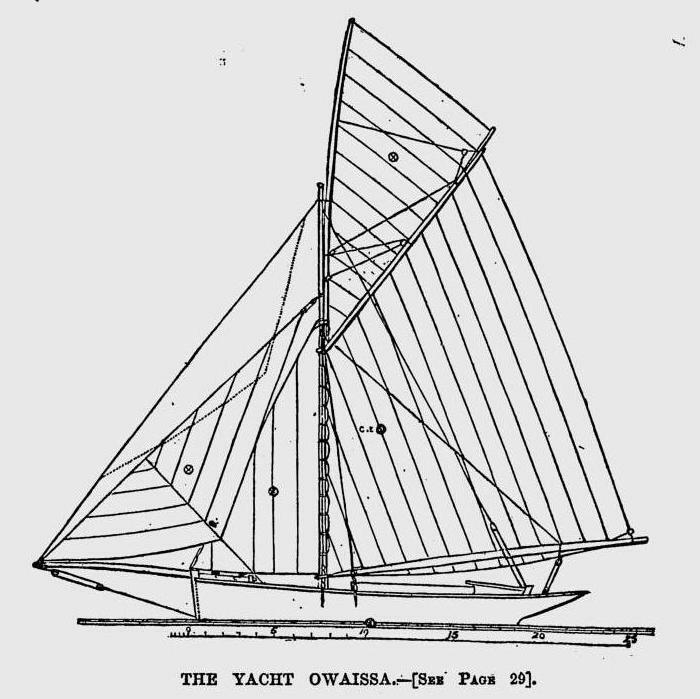 Described as a scow type. ie chined hull and flat run aft. Destroyed by fire 1911. 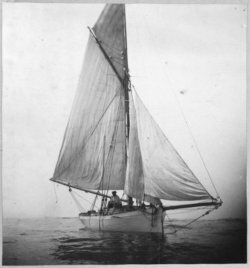 Notes:Renamed Violet in 1929, probably by her second owner R. Rolle. Sail area 179 square feet, Mast height 26 feet. Known for her red sails. 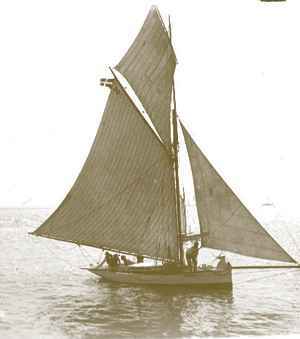 Notes:In 1911 J. Macky altered her rig from a yawl to a cutter. He raced her successfully on the Waitemata Harbour. 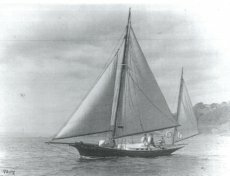 E. H. Northcroft changed her back to a yawl rig [when did he own her? she was a yawl in 1919]. 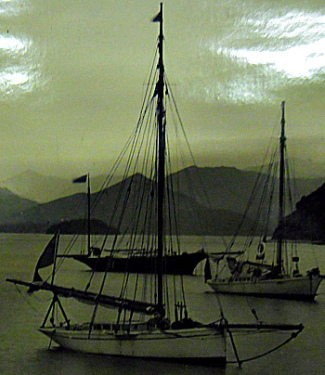 Bought by Norman Thomas in 1944, she completed South Island circumnavigation in Feb-Mar 1946. 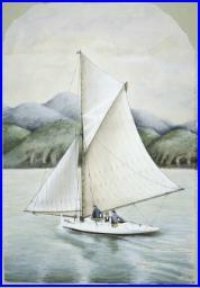 Sailed to Sydney, Australia in Dec 1946 to compete in Sydney to Hobart Yacht race. 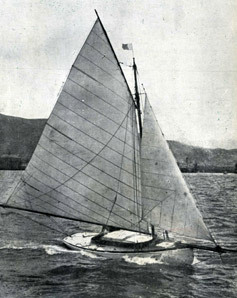 She was the first NZ-based boat to compete the race. Roydon Thomas, at 13, was the youngest competitor. Delivered to Tongan owners in Oct 1948. Wrecked on Minerva Reef southwest of Tongatapu on 7 July 1962. Notes:Arrived Wellington 1910. 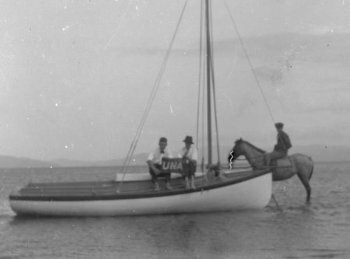 Moored in Evans Bay during the 1920s. Sold to Lyttelton 1933. Wrecked ca. 1960 in Lyttelton. William Gower was a pharmacist. Notes:Draft 1, 11. 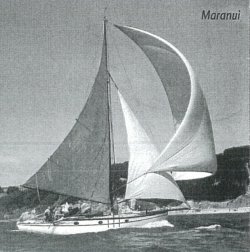 Built for racing with the Arawa Sailing Club. Mae of white pine (kahikitea). Had bouyancy tanks built in bow and stern. Notes:Built a a second or third class yacht. 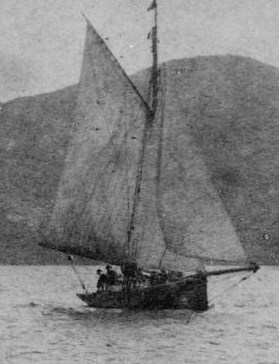 Renamed Kotuku during the 1890s. 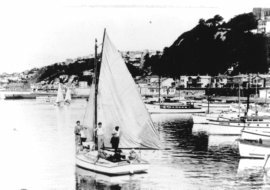 By 1914 had been converted to a Launch based in Waitara. 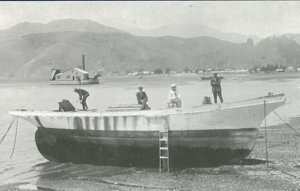 Notes:Converted to a motor launch some time after 1905, and subsequently used as a work boat in the Northern waters of the South Island. Two extra layers of planking added in Kidd restoration. Notes:Built to order for Wellington clients. After being sailed in Wellington for a season, moored in Porirua harbour. Notes:When in Wellington she was known as Kotiri II so as not to confuse her with the Petherick-built vessel of the same name. 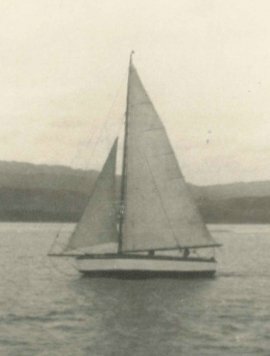 Notes:First sailed at Lake Horowhenua with the Levin Club (defunct by 1926), then moved to Paremata in 1926 where she was rerigged as a sloop and raced by F. W. France and W. Ginders. 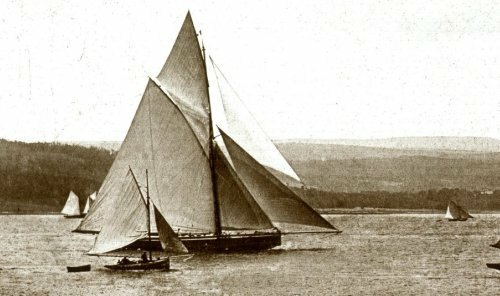 Notes:Considered a cruising yacht and very comfortably fitted out in in 1885. 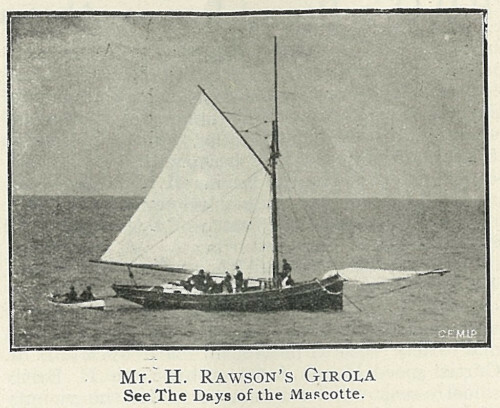 Renamed Girola before 1885. Completely replanked and spars replaced 1885. When more work was done on the stem and keel in 1886 it was noted that there is little of the original boat left. Notes:3,6 draught. Sharp owned her only one year. 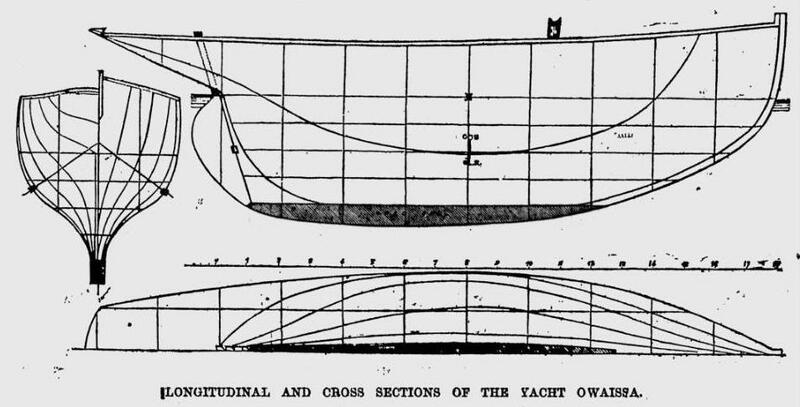 Scow type with flat bottom and V-section. Internal water ballast. Not successful. Notes:Renamed Waiata at some stage since ca 1960. Reverted to original name 2013. Mistakenly thought to be a 1905 Logan build for some time. The troubled passage from Auckland - Nelson took nearly one month, with stops at Tauranga and Wellington. Notes:Appears to have been in a syndicate for much of her life, so parsing out owners is difficult. Jamieson syndicate included Lionel B. Rogers and J. F. Harrison ca 1909. Broken up 1917. Built for a Wellington syndicate. Dr Fell painted her dark green or black. Auxilliary installed 1911. Renamed Romp 1919. Painted white and skylight added 1910. 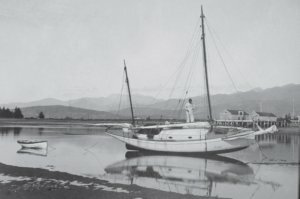 Moored at Te Aro until 1919, when she was moved to Evans Bay. Notes:Draft 4'. John Wray acted as navigator for her delivery trip from Auckland. 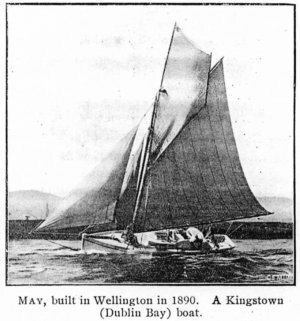 Notes:In Wellington from 1909. Painted green 1909. Notes:Draft 4,6. Adapted from a competition prize-winning design in the "English Yachting Monthly". Sailed by Cull to Lyttelton where she stayed in his ownership for some time. Said to have influenced the design of Ngataringa (Carter). Notes:Built as a centreboarder for commercial fishing (named Seagull), purchased back by O. 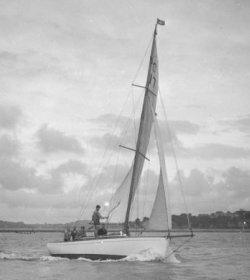 B. Waymouth, renamed, and converted to keel yacht for racing. Arrived Wellington 1889. By 1900 already considered old, leaky, and not a good sea boat. Converted to a launch and operating at Nelson some time before 1914. Notes:Built by Thomas Le Huquet for his son Edward. Spent time in Lyttleton after leaving Wellington the first time. 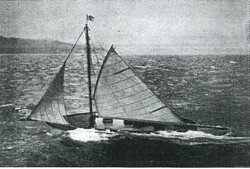 Converted to bermuda cutter rig at some stage (1950s?). Had extensive restoration and rebuild 1990s. Notes:"Scow" type, raced against the 1/2 raters. Notes:Built to American plans. 26 ft mast quickly reduced to 22 ft. Mahogany planking, Douglas fir deck. Fittings Chrome plated brass. 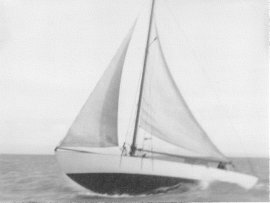 First yacht built by this partnership. William Moore (Wellington, 1898-1906); Berkeley Clarke (Sydney, 1906-1913); William Charles Boesser (Sydney, 1913-1926) George and Edith Huddleston (Sydney, 1926-1943); Harry Stewart Elderfield (Sydney, 1944-1947); Charles Roy Dillaway (Sydney, 1947-48); Richard Edward Sonners (Sydney, 1948-53); Fred Parker 1961); David Ferguson and Rich Poole (Sydney, 1970-1977). Notes:Painted white to differentiate her from near sister Kotiri, which was painted black. Went to Sydeny 1906. 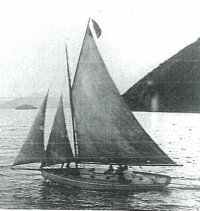 Converted to bermuda rig 1936. Last recorded existence in 1977. 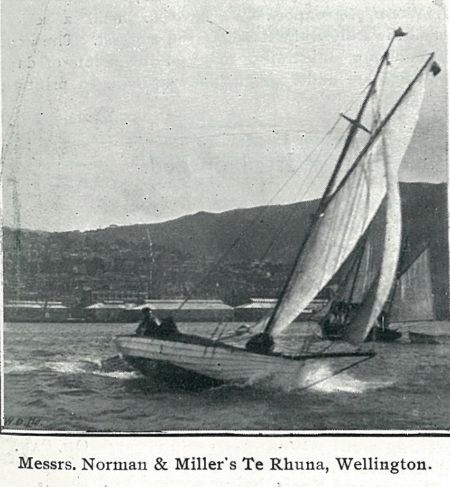 Medina was a Wellington boat for a while she was owned by the legendary Snow Oliver for many years. In the early 1970s he raced her to Noumea, three days out they hit a whale on the way limped in and made repairs I still can see today. I spoke to Snow a few years ago and heard the whole story, basically they were enjoying some fast downwind sailing and all four crew were in the cockpit watching two whales surfing waves behind them, then the helmsman yelled a warning a third whale had come to join the other two and Medina struck it full on. They began taking water and were ripping up floorboards up forward till eventually they found that the planking had sprung from the stern. They wrapped a sail around the stern and continued to Noumea. Previous owners included the Dymock family in Nelson (they owned the Logan Rainbow at the same time) she went to Christchurch approx 1975 - 95 in Christchurch, owned by Alan and Ngareta Inglis. 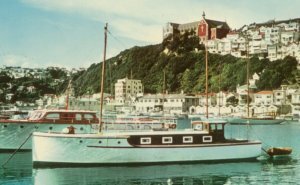 I bought Medina in Nelson in 2006, she spent around 20 years 1975 – 95 in Lyttleton, 1965 ish to 75 in Wellington, the 50s/60s in Nelson, there is a gap back between that and the Mackey’s owned her from 1936 - 40s in Auckland they bought her off Bert Woollacott (they are the family who started up the Southern Cross hospitals) (they also owned Ilex). Notes:Active in Wellington 1907-27. Poneke renamed Nancy Stair. Usually black, painted white with green stripe 1909. Painted black 1915. Lead keel removed for war effort and replaced with concrete. Lead put back on 1921. Sank at her moorings in Evans Bay after Shamrock drifted on to her. Repaired and put up for sale. Additional lead added 1926. 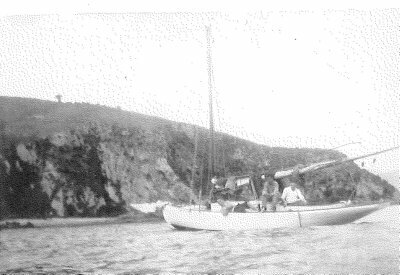 Notes:Moored in Evans Bay during the 1920s. Notes:Sister to Vagabond. Participated in rescue of survivors of the 1968 Wahine disaster in Wellington. Wheelhouse changed by Bruce Askew ca. 1980. Notes:Draft 8". Eight tons, rated 9. Under Jack's ownership was painted black and had dipping lug mizzen. Painted white from 1910. put ashore 1912 for breaking up, still lying there in 1915. 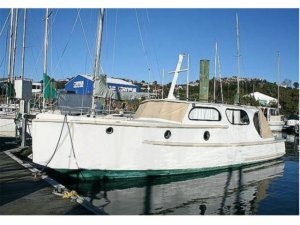 Notes:Converted to keel yacht 1910, and cabin added. Blair kept her at family moorings at Karaka Bay. 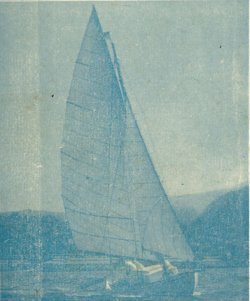 Notes:Converted to yawl in 1929. 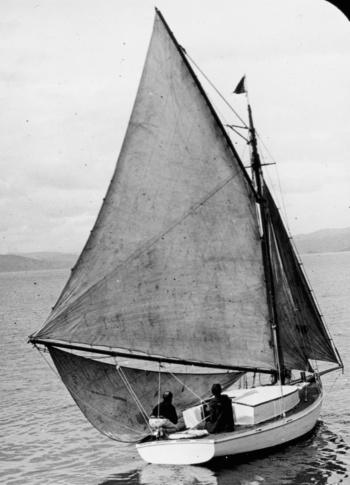 Centreboard replaced by deadwood keel 1947, and changed to gaff rigged sloop. Notes:Renamed Wonga ca. 1935. 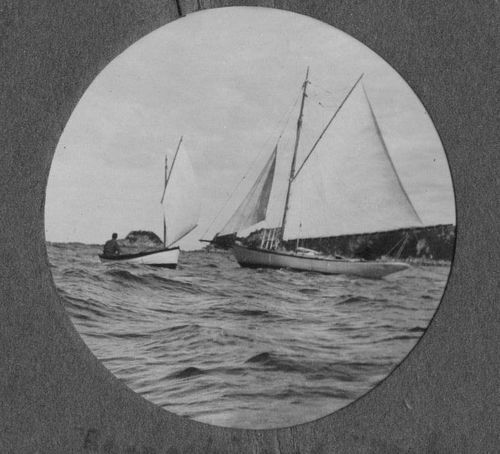 An Evans Bay Boat. 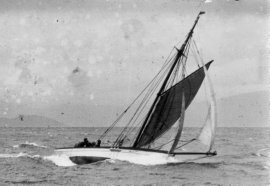 Notes:Sank in Kau Bay after a collision with Iris. Carter notes she had an 8' bowsprit. 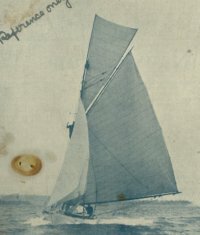 Notes:Built with a stright stem, Clipper bow added in1888. 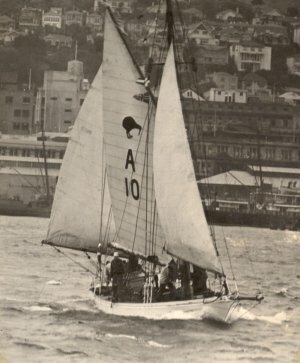 Based in Lyttleton for most of her career, she made regular trips to Wellington to compete in regattas until the 1930s. 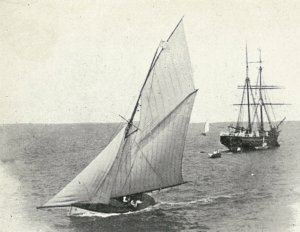 Notes:Hill brought her to Wellington to race in 1878. Counter added ca. 1880. By 1888 had external lead ballast. 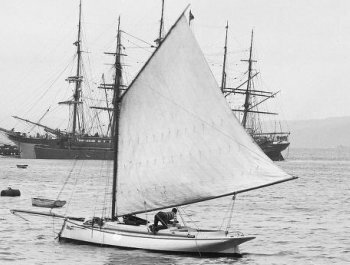 Notes:Sailed to Sydney in 1926 and sold. 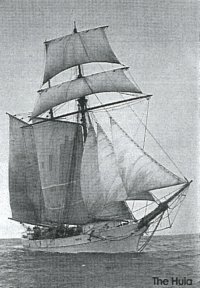 The plan in Sydney was to raise her decks and convert to a schooner rig. 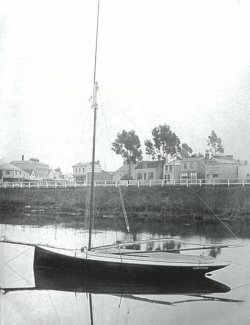 G. H. Jackson was the first commodore of the Evans Bay Yacht and Motor Boating Club. 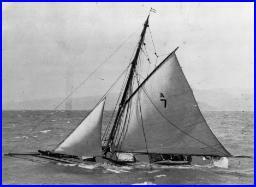 Notes:Rigged with a squaresail at foremast under Bothamley's ownership. Moved to Auckland 1949[?]. Lost without trace in March 1997 when hit by cyclone Gavin in Coral Sea en route to compete in Tall Ships race from Hong Kong to Osaka Japan skippered by Bob Cornell. 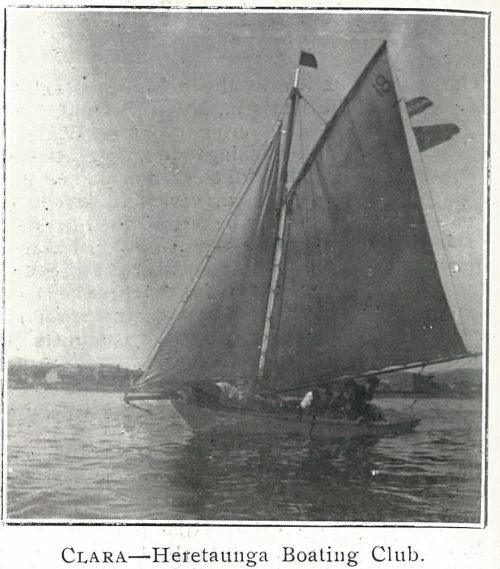 Notes:Converted to cutter rig 1913. 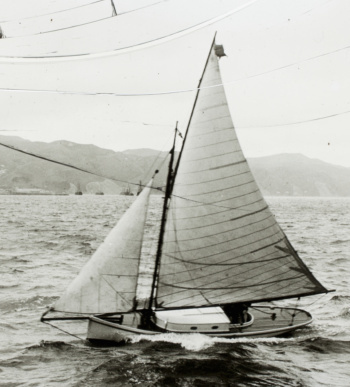 Abandoned and left to founder after losing sails and boom during a gale off Terawhiti. Crew of three safely recovered by the Matangi. Nigel Blair hared ownership at various times with his father David K Blair, and Bob Murie. Notes:Red Jacket is a tobacco brand. Notes:Based on John Alden's Discovery design. Built for offshore passage capability. Arrived Wellington 1925. 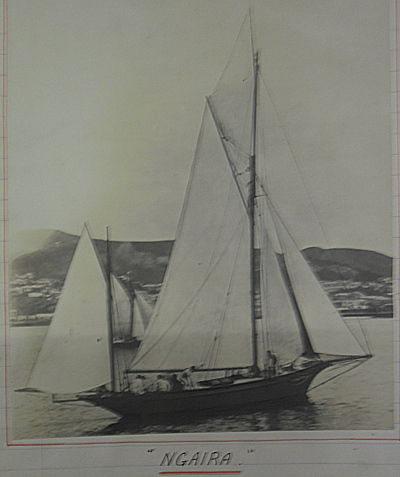 Launched as a cutter, but was rigged as a yawl at least during passage Wellington to Auckland in 1932. 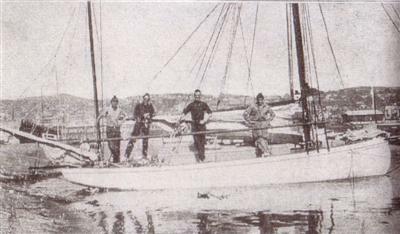 On board were J. McLean, Miles Hamill, Herbert Smith and Robert Prince. 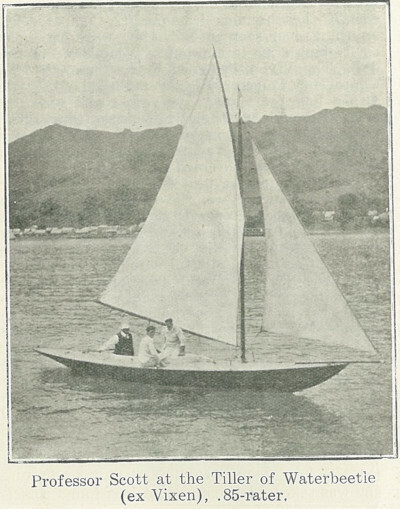 A cruise to Fiji had been planned, but McLean took ill and the boat was latterly kept at Whangaroa. Notes:Described as a miniature Wylo. Had a combination of external (one ton) and internal ballast. Draft of 4 feet. Designed primarily for cruising, had accommodation for three adults. Still sailing in 1938. 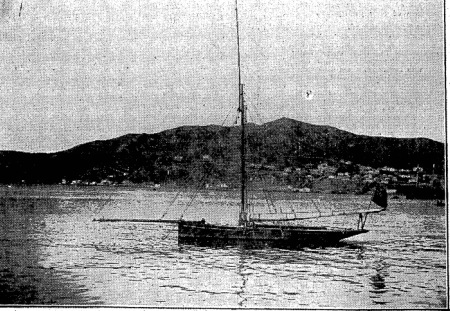 Chesson took her to Lyttelton in 1914. Owners:F. J. Halse (Wellington/Lower Hutt) ??-?? Notes:In 1895 RPNYC club census. 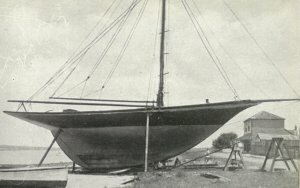 Half-decked clinker. Had a clipper bow. Notes:1 ton lead added to external ballast shortly after arrival to Wellington. Re painted black 1911. Has been through various configurations. 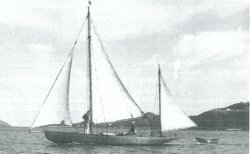 Raised cabin built and converted to bermuda sloop rig ca1950s. Restored to original configuration during the 1980s and 90s. G. F. Bothamley crewed in 1894. Notes:Timber purchased pre WWII but construction not begun until after the war. Sold to English couple in 1995 who sailed her to Europe via Indian Ocean and Red Sea. The kauri timber for Ruawaka’s construction was bought before world war 2 which interrupted the building as George saw service in the war. Construction was 3 skin kauri, with 2 opposing diagonal ½ inch skins and one fore and aft skin on the outside, with copper nails roved over. 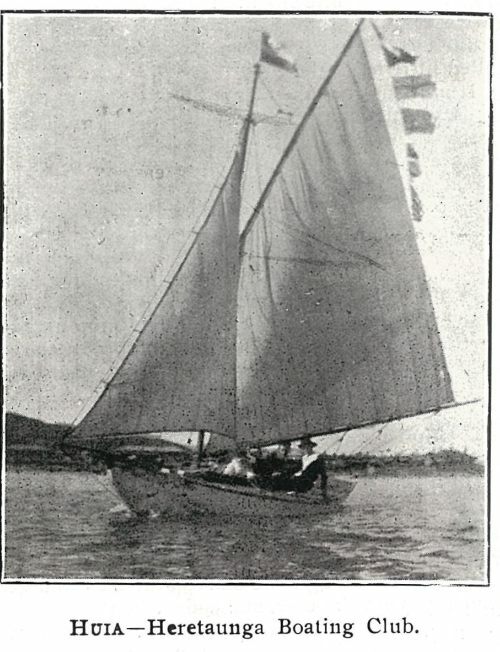 The lead keel was poured on the hard at Evans Bay and fitted after she was transported from her building site in Grafton Rd, which was where brothers Bill and George lived. The mast was hollow Oregon, varnished, keel stepped. 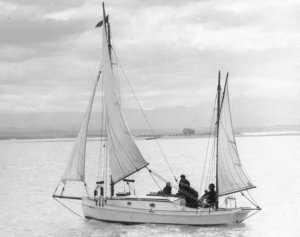 Ruawaka originally did not have an inboard auxiliary motor, relying on a Seagull 4.5 hp barge pusher outboard when there was no wind. Later in 1960’s a 33 hp Perkins engine was fitted with the propeller offset to port. 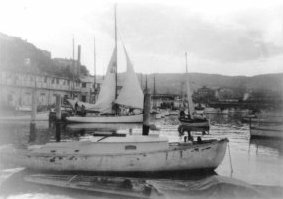 Berthed in the ‘boat harbour’ ie Clyde Quay boat harbour while owned by the Fisher brothers and had a successful racing history in the 1950s. 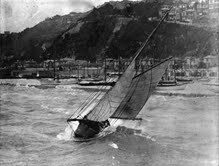 Ruawaka sailed in the tragic Lyttelton race of 1951, suffering some damage but returned safely to Wellington. I donated the pennants she won and some other material to the Wellington maritime museum some years back.I have a collection of silver teaspoons won by Ruawaka stored at another house, that I will aim to collect and document. 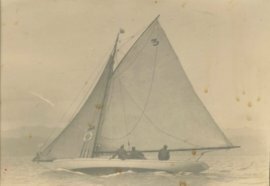 Notes:Built as a 3hp auxilliary yacht, converted to 5-6hp almost immediately. The owners presented a trophy for competititon among the "mosquito" centreboarders in 1906. Extra skin added by Ted Bailey 1909. Hull colour changed from green to white 1909. 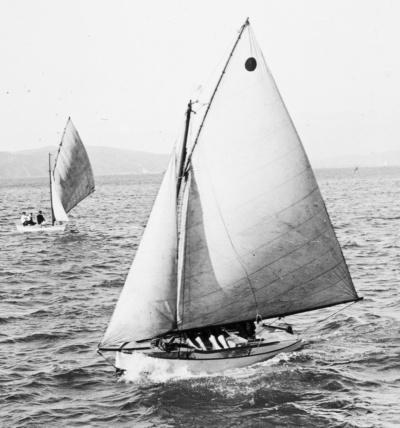 At first competed in racing for motor vessels, by 1914 in the sailing fleet. In Wellington in 1920. 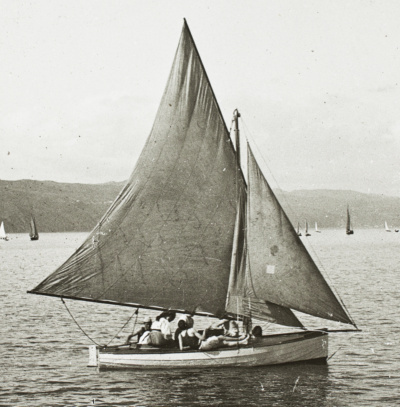 In the Marlborough Sounds 1922. Wrecked at Castlepoint en-route to Auckland 1946. Notes:Fitted with her first inboard auxilliary in 1926. Renamed Annetta ca 1932. A yacht of this design named Seabird, associated with Wellington, was broken up in 2009. Notes:Launched with a inboard auxilliary. Received major restoration in Wellington, 2007. Notes:Draft 9,6 when built. Internal sand ballast removed and replaced with external lead ballast 1888. Notes:Built for cruising with heavy timber furnishings. Panels painted in Seascapes. 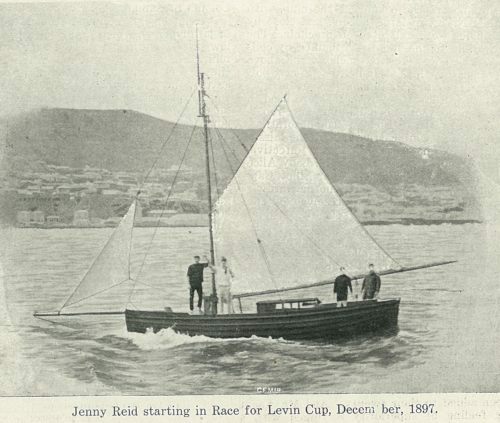 All stripped out and refitted for racing in 1898. Painted white 1910 then royal blue 1911. Given iron keel 1913. Occasionally rigged as a cutter. Wrecked at Black Rock at Cape Palliser, outbound for Auckland and Tahiti. One survivor, two deaths. The further tragedy is that these two men (Hale survived) had just returned from 4 years active service. Notes:Open boat. Active Wellington ca. 1880. 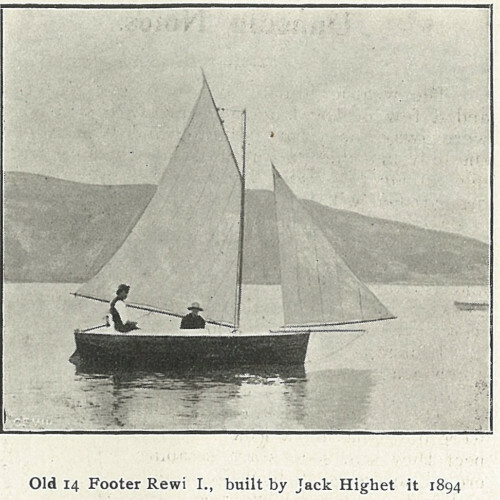 Owners:Altered and enlarged, false keel and lead added 1909. 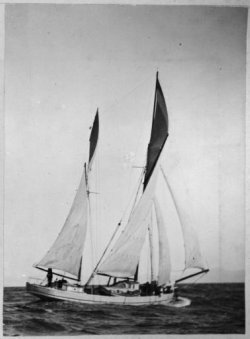 Notes:Draught 4.9. converted to fin and bulb keel 1900 by Bob Stead, not successful so converted back to keeler by Jack Highet. Still in Wellington 1948. 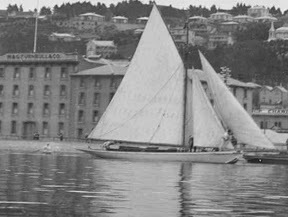 Taipare was Wellington's first spoon-bowed yacht. "...she was built by Harry Bender, in Wellington I think, as a steam launch. She then got tricked out with a retro bow etc and turned into 15hp Union petrol-engined auxiliary owned by G.H. 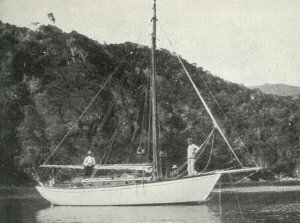 Jackson who sold her in 1920 and had the strange yacht Psyche built by Ernie Lane in Picton which he sailed to Oz in 1926 (see pic of her in Little Ships). 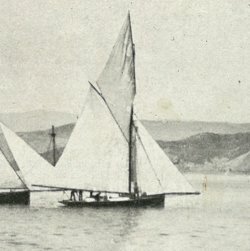 Jackson had married Helen Guard of Port Underwood and Taniwha became the undisputed champion of Cook Strait crossings. 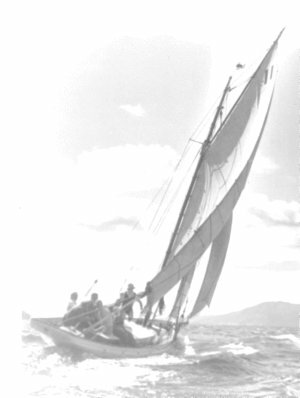 Reid and Perano took over Taniwha in 1920 for use in the Sounds. She was licensed to carry 35 passengers in 1924. But after that her fate is unknown to me." 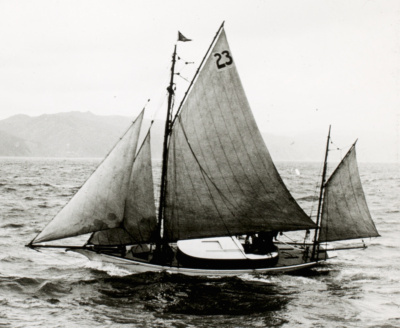 After a spell fishing at the Chathams, Taniwha was badly damaged in a NW gale on the rocks at Evans Bay in October 1917 and was then sold as is where is by auction. I imagine she was bought and repaired by the likes of Ernie Lane. It's possible Jackson had sold her by 1913 when she went to the Chathams in fact. Actually she started life as a fishing cutter called Louie, built by Harry Bender as a young man. He put a steam engine in her in 1898. 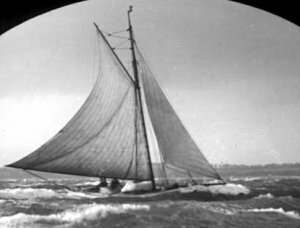 I think Jackson changed her name to Taniwha when he bought her from Bender around 1908. He put a 20hp Gardner in her and lengthened both ends. 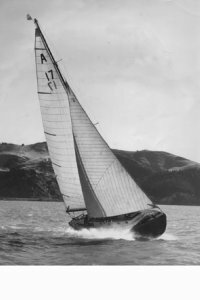 Notes:Won the Lyttelton-Wellington race 1940, and Wellington-Lyttelton race in 1951, the only vessel which mangaged to complete the race that year. Notes:Also known as Tearoa. Went ashore Pencarrow 1905 with loss of three lives. 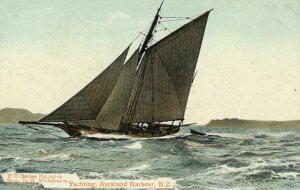 Notes:6' draught.Atkinson commissioned John Wray to deliver the vessel to Auckland. See "South Sea Vagabonds". re-built in Auckland by Sam Ford. 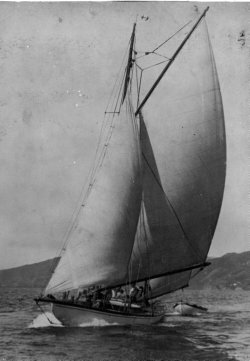 Lamb changed the vessel's name to "Te Hongi". Markwalder purchased her for Pacific cruise. Notes:Built for Wellington clients Batkin and Werry. Arrived Wellington 1880. 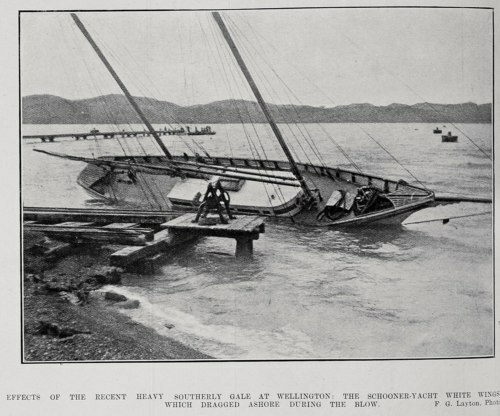 Loosed moorings and ran ashore at Kaiwharawhara. Total loss. Notes:Based on American ideas, she had long overhangs and boulder ballast. Was not successful. Notes:Built for Keir, Commodore of the Heretaunga Boating Club. 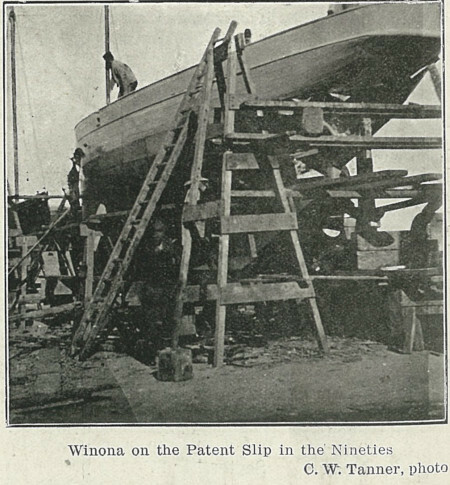 Renamed Winsome 1914. Notes:Open yacht. Charles Bailey Jr built a counter on Toy during a visit to Wellington. 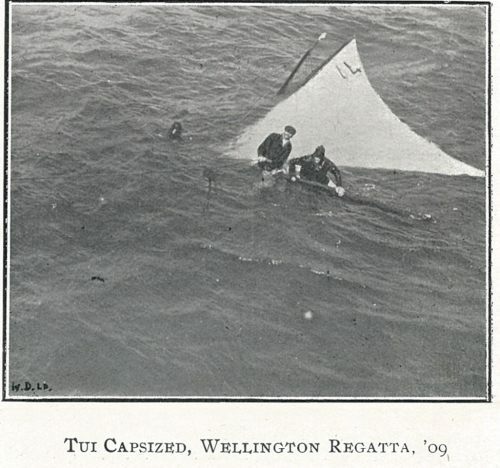 Lost during a gale in Wellington 1915. Owners:H. Turner and partner (Wellington, 1914-1915-?? ); Fred Pratt and Harry Hardham (Wellington, 1910-1914). 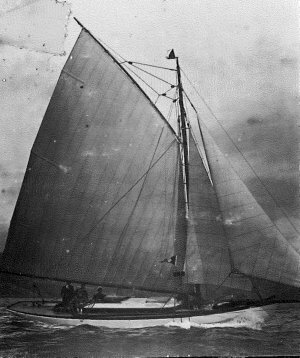 Fred Pratt sold her in 1914. Notes:Modified Seabird design with counter added. 6' draught. Norwegian pilot cutter style. 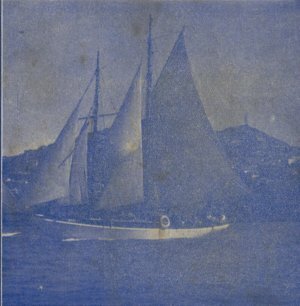 Sailed from Sydney to Lyttelton by C. F. Pratt. Norman W Thomas bought Typee in Dec 1948 or early 1949 from George Dimock in Wellington. He sold her in early 1950. Notes:Based on New England catboat designs. Built to race at Heretaunga Boating Club in Petone. Sister-ship to Nautilus built by Harry Head. Concrete keel added in 1917. Possibly renamed Platypus 1935. Notes:Launched January 1926. Fitted with 10-14hp Ailsa-Craig, which had a new type of reducing gear allowing the propeller to turn at half the rate of the motor. This was intended to steady the vibrations of the motor. A sister ship (Nereides) was built 1926 for C. Mitchell of Wellington. Powered by Ailsa-Craig 35hp with reduction gear. Notes:Keel remodelled 1912. engine stolen 1916. 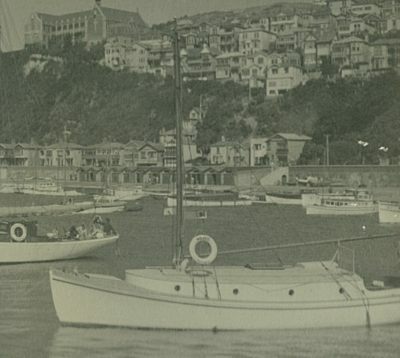 Moored in Evans Bay during the 1910s and 20s. Renamed Clutha in 1930. 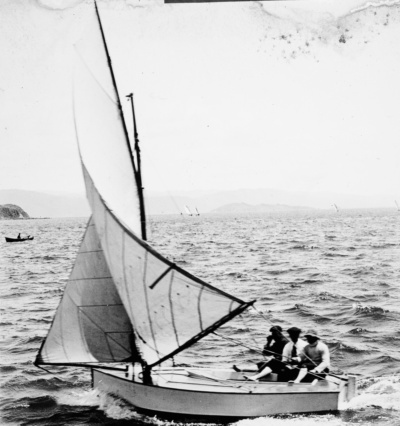 Notes:1st of the boats to have been built to the 5 rater rule in NZ. 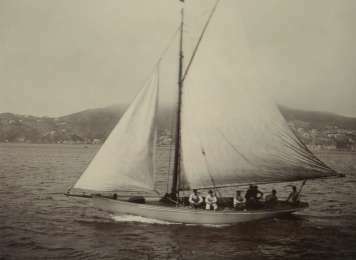 Launched as Moana, later renamed Waiwetu in Wellington. 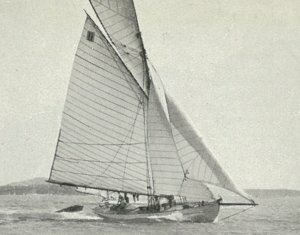 Won Wellington's first ocean race (Port Underwood) in 1911. 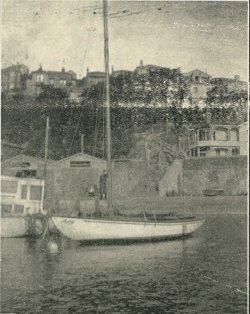 Headland converted to marconis sails 1934 and built new house 1935. 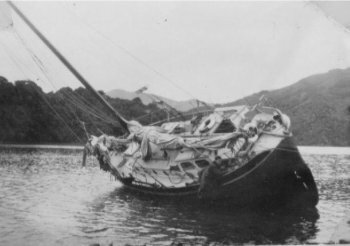 Wrecked near Ngauranga after loosing her moorings in 1899, and again in 1950. Notes:Designed by Charles Bailey Jr. Carries a carved Viking as figurehead. Arrived Wellington 1946. 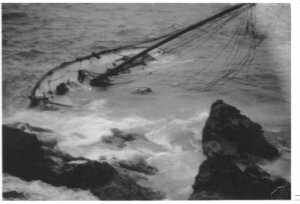 Notes:Wrecked at Cape Palliser 1942. Mr Tonks crewed with Neal. Notes:Renamed Haeata 1893 or before. 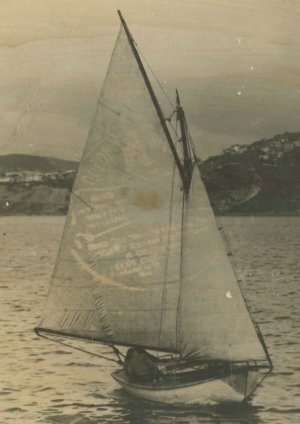 Notes:Crewed by Thorndon Dinghy Sailing Club when owned by Scott Bros. Moored in Evans Bay during the 1920s. 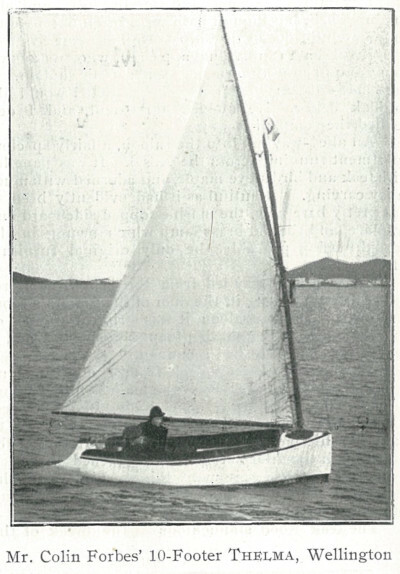 J Scott converted her to a yawl 1912. Forbes may have purchased a share 1912. Returned to cutter rig ca. 1926. 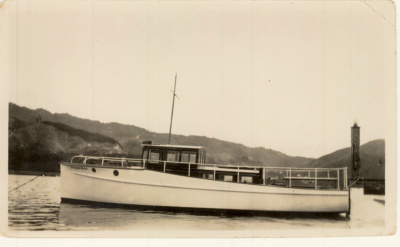 Sank at her moorings in Evans Bay 1941. Salvaged by Allan Johnson. Carter (1948) notes she was still being overhauled, so likely she never got back in the water. Notes:Draft 5,10. First engine (Ferro) engine installed 1910. Fitted with 6hp two stroke auxiliary in 1913. 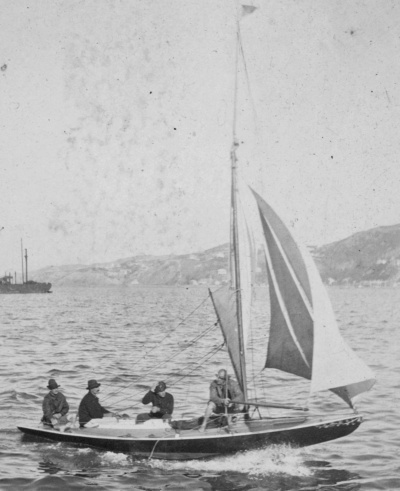 Arrived Wellington 1909. Painted black for a period from 1916. 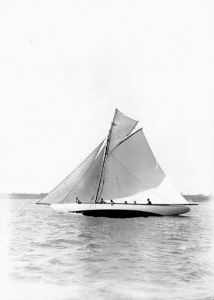 Notes:Built specifically to win 1895 Wellington Anniversary Day Championship Race, which it did. 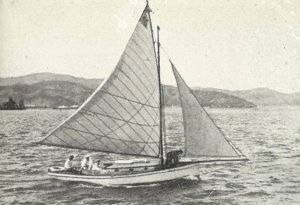 Engine installed and converted to ketch 1909 (trisails). Reverted to gaff cutter 1911. Chapman may have converted her to a ketch for the trip to Townsville. Notes:Crocker design number 198. Her lines were taken off by Archie Scott in 1944. During the war years, was skippered by Roy Mill until he joined the armed forces when she was laid up until the Elliott boys returned. Took part in 1951 Lyttelton Race. Retired to Kaikoura with broken forestay. 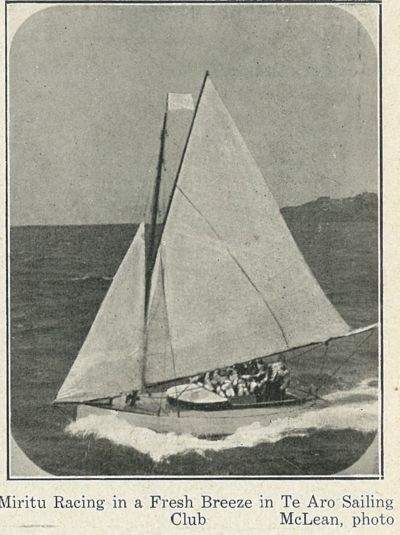 Notes:Was built with a self draining cockpit (drained into the sea) In 1925 was fitted with an inboard auxilliary and cruised to Tauranga via Auckland for swordfishing holiday. Notes:12 tons. Reported to have new Wellington owner 1888. Arrived Wellington 16 December 1908. Bucholz renamed her Ida, though reverted to her original name when he sold her. 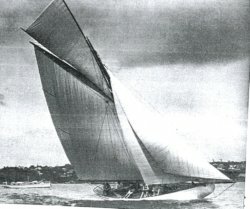 Converted to yawl late 1909 (Hoggard and Donne); Under McLean's ownership in 1916 was the first yacht to make the return voyage to the Chatham Islands from Wellington. Sold to Suva owners in 1925. Notes:Lightly ballasted, very fast downwind, not very good upwind. Dramatically altered in 1912 and extended by 6ft at the bow to 59ft oa, 12ft beam and drew 6ft 6in. Converted to launch 1920. Sold to a Wanganui owner for the purpose of fishing. Notes:Draft 5,9. 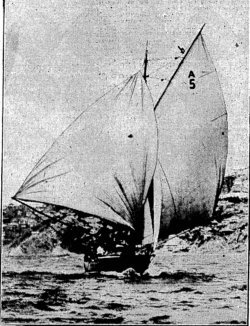 Disappeared with all hands on return trip from Chatham Islands, January 1931. Notes:Arrived Wellington 1891/2. Also spelled Wenona. Renamed Flora by 1896. Designed in 1904. Sail area 500 sq. feet. 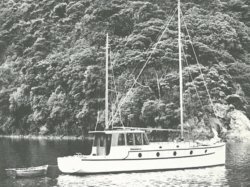 Fitted with Zealandia inboard at time of construction. 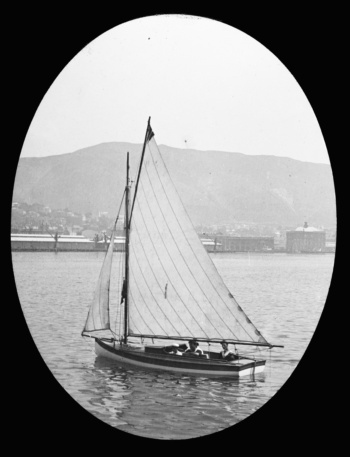 W. Duncan was commodore of the Port Nicholson Yacht Club and chairman of the Wellington Yacht and Motor Boat Association. Notes:Launched in August, the build took 14 weeks. Hull lined with concrete. 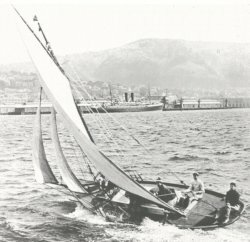 Reputed to be the first vessel built in Wellington with external lead ballast. E. C. Mills Jr, campaigned her successfully in Wellington, Nelson and Lyttleton during the 1870s and 1880s. 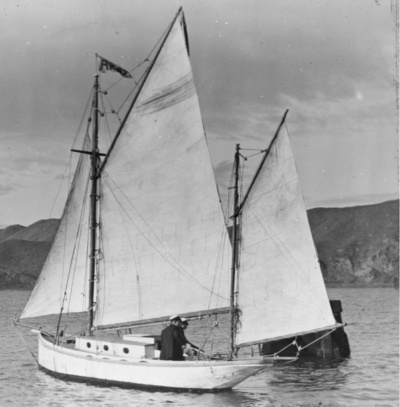 Disappeared while at anchor in the Marlborough Sounds June 1900. 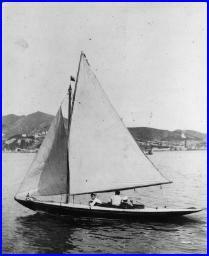 Was compared at the time of launching to the designs of Herreshoff. 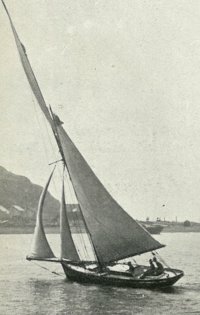 Later converted to gaff cutter. Had full restoration during the 1990s. 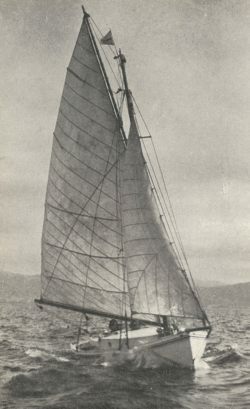 Notes:Carried pole mast (as opposed to topast), which was a new idea for racing yachts. In Wellington by 1938. Currently in Lyttleton.